I am still trying to come to terms with having my team booed off the pitch in our own stadium at half time on Wednesday night. That was a ‘first’ for me as a manager and was particularly disappointing because I have never had a word of criticism for the Manchester City fans who have been absolutely magnificent since I came here. I am constantly singing their praises, home and away. And I am sure I will again. What happened on Wednesday, when we played Sporting Lokeren in the UEFA Cup, was so out of character. And what really disappointed me was that some of the crowd were trying to get at one or two of our players. I had made the point before the game that it was going to be so important for our fans to get behind us from the start and they did when Antoine Sibierski gave us a’dream start’ with a great free kick after seven minutes. But when we gave away two poor goals and went in 2-1 down at half time, the crowd’s reaction was very disappointing. We weren’t booed off even when we were losing 4-0 at home against Arsenal last season and I honestly don’t believe the crowd reaction on Wednesday night was justified. I don’t think my players deserved it after all the effort they had put in against a side who had come with a game plan and made it very difficult for us to break down. They say you should never criticise your own supporters but I always try to be honest and, on this occasion, I feel it is fair comment. Our supporters could have helped us more on the night although we did win them over at the end when we gave them something to shout about and won 3-2. I was asked on the television if I thought we had got out of jail and I said ‘No’. We deserved to win the game because we had so much of the play. We just dug a hole for ourselves by conceding two soft goals in the first half. At least we showed the character to dig ourselves out of that hole when a lot of teams might have gone under. You have to be patient in twolegged football. Lokeren had made a poor start to the season and they were determined to make life difficult for us. They played with five along the back and the only players who were going to find any space were the full backs and the midfielders. Most of the time there was no space for our forwards. particularly the strikers, and it got tighter and tighter. 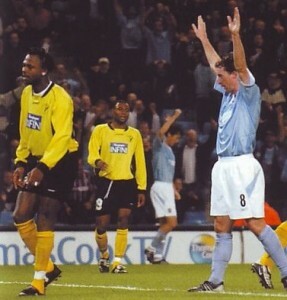 But both of them, Robbie Fowler and Nicolas Anelka, worked their socks off. And they did get a goal each. We just didn’t create enough clear chances for them and although Lokeren didn’t threaten our goal at all in the second half. they had something to defend after punishing our poor defending in the first half. David Seaman came in at half time and said ‘Sorry’ for the first goal but I think it would be harsh to blame him because he was left in no-man’s land. The Lokeren goalkeeper kicked long and high and Sun Jihai tried to head the ball back to David when he probably didn’t need to. He didn’t make enough contact and the ball went straight up in the air and was dropping on the edge or just outside the box. David didn’t know whether to ‘stick or twist’ and, in the end, the Lokeren player nipped in and took his chance. Football is all about decision-making and that was a poor goal to concede. Lokeren probably could not believe their good fortune when they scored again from probably the only other opportunity they had in the entire 90 minutes. We had all the play in the second half but the goals wouldn’t come until we brought on Shaun Wright-Phillips to give us a bit more pace and urgency. Paul Bosvelt had done a good job probing and foraging in midfield but we needed to try something different. We had to make another change when Danny Tiatto had to go off, with a ‘dead leg’, and we switched Sylvain Distin to left back with Richard Dunne going on at centre back. Eventually, our constant pressure paid off and with better luck and better finishing we could have won even more decisively. But, from the position we were in at the interval, we were pleased to get a win although the tie is now on a knife-edge. We go to Lokeren for the second leg on October 15. 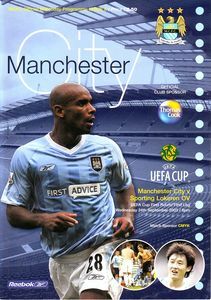 Manchester City’s progress in a competition that they could feasibly win is in the balance… only a late goal from Robbie Fowler, on his return to the starting line-up, and a penalty ny Nicolas Anelka gave City the advantage against palpably limited opposition. … Barely fluent in their play, the game was still played almost exclusively in the Lokeren half in the second period and, 14 minutes from time. Fowler’s luck turned. 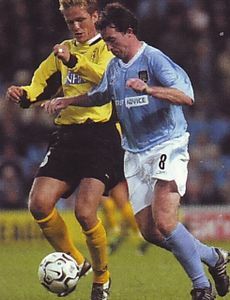 Steve McMananman played the ball wide to Jihai Sun, whose centre was headed down by Sibierski and Fowler with a touch somewhere between a trap and a shot, scored.